SweetIM is a cool new plugin for Internet Explorer that would allow you to spice up your online conversations with cool emoticons and smileys. While most messengers, webmails, forums, blogs and spaces would allow you to add their own smileys and emoticons, theirs are just plain boring; it’s small, not animated, and doesn’t have any sound. SweetIM’s emoticons are fun to use since SweetIM’s smileys are animated and entertaining, guaranteed to make the person you’re conversing with online to smile. 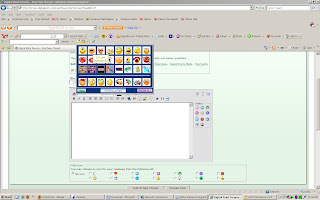 SweetIM is unobtrusive and will sit nicely on top the toolbar of Internet Explorer. It’s easy to install plus, there are no annoying pop-ups or spyware and adware that usually comes with free downloads. I had a little trouble with SweetIM’s interface. I initially thought that when you click on the smiley that you like, it will automatically insert itself on the forum topic but you actually have to choose which service you’re going to use SweetIM (ie, forum or email) then you have to copy and paste their code unto the web page. But other than that, I have had no problems using SweetIM. So what else are you waiting for? Liven up your online conversations today with SweetIM.